As an analyst, the six P's are part of my mantra. Piss Poor Planning Prevents Poor Performance. Unfortunately, I fell foul of this yesterday when I realised too late that Chinese New Year was today and not next Monday. Ooops! With a busy day on the first day of a new secondment, there was no time to stop by the supermarket to pick up the veg I needed to make the dumplings I'd hastily researched last night so I had to abandon the plan and went with the Chorizo Hash I'd previously planned instead. I feel a little guilty about this recipe. Yesterday I was looking for a recipe for chocolate and beetroot cake and happened across a blog by a food writer who openly derided people like me who regularly turn to the internet for recipes. He believes that the only recipes worth making are those that have been tried and tweaked and enhanced and tested and tweaked again to perfect them. He finds things like the quick and easy recipes peddled by certain websites anathema. Well lucky him. I'd love to live a life where I had nothing better to do all day than sit around perfecting recipes. Instead, like so many other people, I juggle life's responsibilities and still take pride in the fact that I cook (nearly) from scratch every night - save for the odd night when the husband yanks my chain and dispatches me off to buy him a takeaway. Even if it is a quick and easy recipe. So tonight's effort was a variation on the husband's dinner. He had sausage, egg and chips. I had chorizo hash with poached eggs. I originally happened across the recipe in Olive Magazine but this is a hybrid of several I've found - mostly based on the ingredients I had to hand. 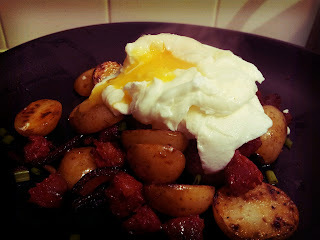 Simple and tasty - although I'm sure it would've tasted even better if I'd fried the potatoes in oil rather than low fat spray and had fried eggs instead of poached - which I managed to drop whilst trying to balance on the top of the mound of potato and sausage, hence the rubbish picture. On the subject of poached eggs, check out the fab Kitchen Bitching blog for advice on how to poach the perfect egg. Boil the potatoes in salted water until tender. Drain. Saute the potatoes in a little oil until browned and crispy. Remove and set to one side. Saute the red onion in a little oil until soft and lightly browned. Add the chorizo and fry for a couple of minutes. Return the potatoes to the pan to warm through. Divide the hash between two plates and top each with a poached egg.